1. Eric Bana can't act. Ah, yes, he can. He was the funniest thing in Funny People (funnier than Adam Sandler and Seth Rogen compared). Bana was the perfect choice for Henry DeTamble, the time traveller who marries Claire Abshire (Rachel McAdams). But I must admit, with Rachel McAdams on screen, he struggled to hold his own. 2. The script was weak. Okay, so it was adapted from the best book I have ever read, so of course it couldn't compare. But it takes a decent stab at it anyway, as much as it can do. But it doesn't stray too far away from the book, which is a rare happening these days. Sure, it has it's weak spots, but it has the right amount of everything in it. 3. It has no point to it. 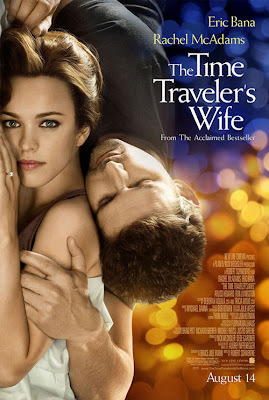 Look, the story is that a time traveller marries a normal woman. What more 'point' do you need?! It has drama, it has a bit of comedy, but first and foremost it is a dazziling romance. 4. It is not a good movie. Well, not everyone will think it's a masterpiece. It is not a masterpiece, it has it's flaws, but what film doesn't? It's not as great as The Curious Case of Benjamin Button or the book, but it is a film to be treasured. Fans of the romance genre will absolutely love this. I cried a few times throughout. Just ignore what the evil critics try to tell you...this is a good movie. I liked this. It was a frustrating movie because it could have been so much more. I preferred the movie's ending over the book's ending. It was wonderfully shot.